Montalvo Arts Center | News | Carriage House Concerts announced, plus Rock the Garden July 20! Edible Dress Tent ready for inaugural performance July 20 at our Rock the Garden party! The Edible Dress Tent (2012), by Robin Lasser & Adrienne Pao, will be performed by a person "wearing" the sculpture. 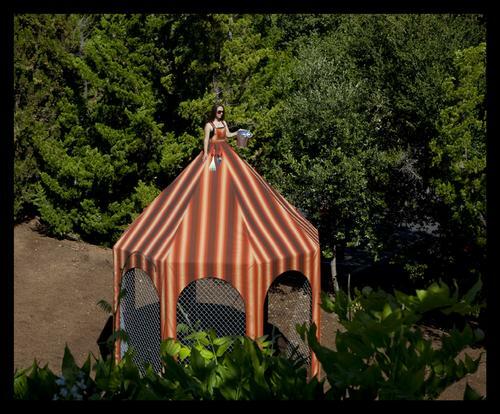 If you have visited Montalvo this week, you might have noticed a striking new sight: Edible Dress Tent, a new sculpture by Robin Lasser and Adrienne Pao, stands over 20 feet tall and is located on the west side of the historic Villa. The piece, part of our 2012 Sculpture on the Grounds, is also surrounded by new plantings of flowers, vegetables, and herbs, which will grow around the perimeter of the tent and produce food. Inside is a swing, and guests will soon be able to relax in the cool shade of the tent and enjoy the view. On Friday, July 20, at 7pm (Members' preview at 6pm), our Rock the Garden party will showcase Edible Dress Tent in all its glory, as an artist will activate the piece with a performance! Rock the Garden will also feature a spectacular interactive video work by Daniel Canogar entitled Asalto Montalvo (see video below). Visitors will be able to participate in this piece by performing on a greenscreen, which will then be projected onto the Villa. Sound artists Kianga Ford and Mamoru Okuno have collaborated on you are here... man.mountain.valley.sky, a conceptual story which will be told through a downloadable audio file for iPod or smartphone as visitors hike up our trails, starting at the newly-restored Belvedere. Just announced! Tin Hat will perform live music on the Great Lawn at the Rock the Garden party! This venerable Bay Area chamber music group has performed with the likes of Tom Waits, Willie Nelson, and Mike Patton, and their music was featured on the soundtrack to the film Everything is Illuminated. Visit Tin Hat's website here. Other sculptures and surprises await, so don't miss this exciting evening of art, music, food, and more! RSVP on our Facebook page, check in, share photos, and enjoy Montalvo's newest sculptural works! Are you looking for a fun, creative, and educational experience to give your child this summer? With more than 20 Summer Arts Camps still remaining at Montalvo, we're sure to be offering something he or she will love. One of our exciting new camps this year is The Shadow: Puppets and Performance (July 9-13, Ages 9-12). 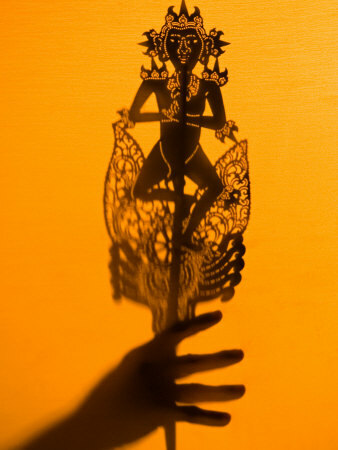 In this unique camp, students will learn about the ancient art form of Balinese shadow puppetry and perform a cinematic tale of their own. Instructed by teaching artist Wendy Testu, your child will create storyboards, stick puppets, masks, scenery, dialogue, music, and props for their story, then perform it at the end of the week. Does your child dream up creative ideas and images that could not exist in the real world? 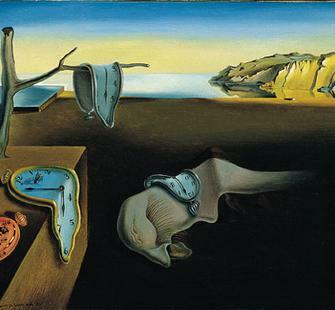 Meet the Masters: Surrealism (July 16-20, Ages 9-12) could be the perfect outlet for channeling that imagination. Looking at surrealist artists including Rene Magritte, Frida Kahlo, and Salvador Dali, artist Nancy Meyer will teach students how to create their own surrealistic art using a variety of unusual mediums. These and many other camps still have limited space available, so register today! Click here for a full list of available camps. Our Members-only Pre-Sale for all fall, winter, and spring concerts is approaching fast, so now is the time to become a Member, renew, or upgrade! Starting on Tuesday, July 10, Members will get first crack at purchasing tickets to more than 35 concerts in the Carriage House Theatre and the historic Villa coming up this fall through spring 2013 (tickets go on sale to the general public on Monday, July 16). Some of the artists include Richard Thompson, Marc Cohn, Suzanne Vega, Masters of Motown, Willie K, The English Beat, Jake Shimabukuro, Spyro Gyra, Alfredo Rodriguez, and many, many more! In addition, you can join us before select concerts for Martini Madness or our new Hawaiian-themed Ka 'Aha Mai Tai - pre-show cocktail hours that will get your night rolling in style. If you are a Member, you should have already received your concert announcement via email and a detailed brochure in the mail. Look for your pre-sale password by email next week! Many of our concerts sell out quickly, and with such a fantastic lineup, we expect this year to be no different. Remember, pre-sales are tiered to different Membership levels, so the higher the level, the earlier you can reserve your seats! Join or upgrade online today or call Chris Wilcox at 408-961-5849. 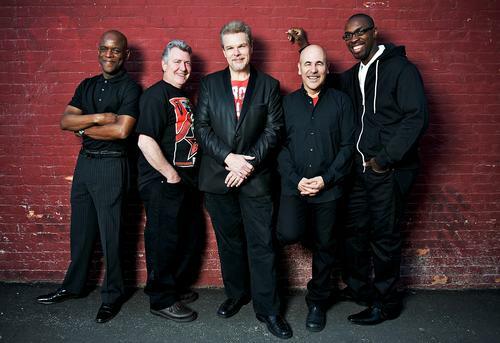 Spyro Gyra performs October 19. On Friday, July 13, at 7:30pm, our Summer Concerts continue with a performance by the immortal Al Green. Purchase your tickets, then reserve a pre-concert dinner on the Veranda starting at 6pm (click here to see the menu). With nine Grammy Awards in a career spanning more than 40 years, the Reverend Al Green's classic songs such as "I'm Still in Love With You," "Love and Happiness," and "Let's Stay Together" (see video above) have set the standard for soul music for more than a generation. A member of both the Rock & Roll Hall of Fame and the Gospel Music Hall of Fame, Green recently appeared on Rolling Stone's list of "100 Greatest Artists of All Time." Don't miss this legendary singer in the intimate outdoor setting of Montalvo's Lilian Fontaine Garden Theatre! Tickets are still available through Ticketmaster; to reserve your pre-concert Dining on the Terrace experience ($44 per person), call the Montalvo Box Office at 408-961-5858. Reservations are encouraged; very limited walk-up dinners will be available the night of the performance. 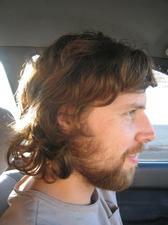 Join us in the Lucas Artists Program Commons this Friday, June 29, at 6pm, for Final Fridays with sculptor Ry Rocklen. Rocklen's work consists of the reclamation and exaltation of found materials. Through simple alterations and additions, these discarded objects are given new life as sculpture. At Final Fridays, he will discuss his work at Montalvo, a planned series of sculptures based on aspects of the sky. This event is FREE; wine and refreshments will be served. Lucas Artists Program Literary Fellow Eugene Gloria will appear at Barnes & Noble Booksellers in the Westgate Shopping Center (1600 Saratoga Ave) on July 7 and 8 from 11:30am-3pm to read from and sign copies of his new collection of poems, My Favorite Warlord. Gloria's poems are meditations on place and identity, evoking lyrical landscapes within family stories. Learn more about Gloria's award-winning work at eugenegloria.com. Former Culinary Fellow Andrea Blum has organized several exciting "Edible Journeys" in September and October. Travel to some of Italy's most delightful culinary regions where you can learn about and enjoy traditional food from authentic Italian artisans and chefs. These week-long tours are offered in Tuscany or Southern Italy. For more information, visit ediblejourneys.com.